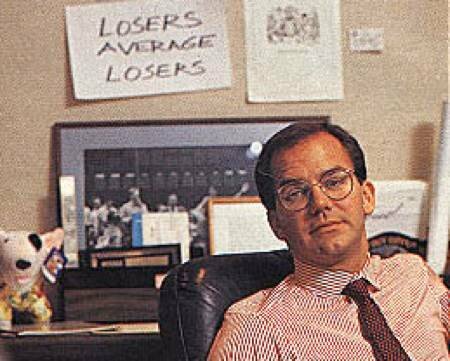 Paul Jones, one of my most respected hedge fund managers, has his motto on the wall, “Losers Average Losers”. For trend investors, stop loss not gain is first rule of short-term trading, needless to say. So, for value investors, how to deal with losing stocks? Stop the loss, carry it, or the lower it falls, the more you buy? there are better other investments. there are other better and cheaper companies. None of these reasons is related to loss or not. 1) above the cost line, the profit is locked at the first chance, and below the cost line, it is never sold. 2) Above the cost line, extremely aggressive, because the money earned is not painful to lose; below the cost line, extremely conservative, because the loss of capital, even if only one cent, is painful. Both extremes are due to the “psychological account” in human nature. Forgetting your costs is the first step in a successful investment. No one in the market knows or cares about your buying costs except you, so your level of cost and loss have no impact on the future of the stock. When Paul Jones determines which stocks are Loser, he does not start at his own cost; he does so from the recent high of the stock price-that’s the point of reference that everyone can see. Forget the cost, and there is no difference between loss-making and profit-making stocks, then you don’t always want to get up from where you fall. Many people lose money on a certain stock, always want to earn back from the stock, the result is that you stay lying down wherever you fall, you miss a lot of other opportunities. Investing is an ongoing process of comparing different stocks, regardless of cost. At the end of a bear market prices are already significantly below value, often attracting value investors to buy on the left side of the bottom where stop losses tend to fall into the pre-dawn darkness. There is only the risk of price fluctuation, not the risk of permanent loss of capital. My four previous blog posts, “Value trap”, “Growth trap”, “Margin of safety” and “True and false risks,” are in fact trying to answer the question: under what conditions you can carry the loss, and under what conditions one must stop the loss. For investors, this is a matter of life and death. Bill Miller, after a brilliant 15 years, lost his reputation eventually. In the sixteenth year, he lost all the excess returns of the first 15 years back to the market. It is a warning that every investor should think about.